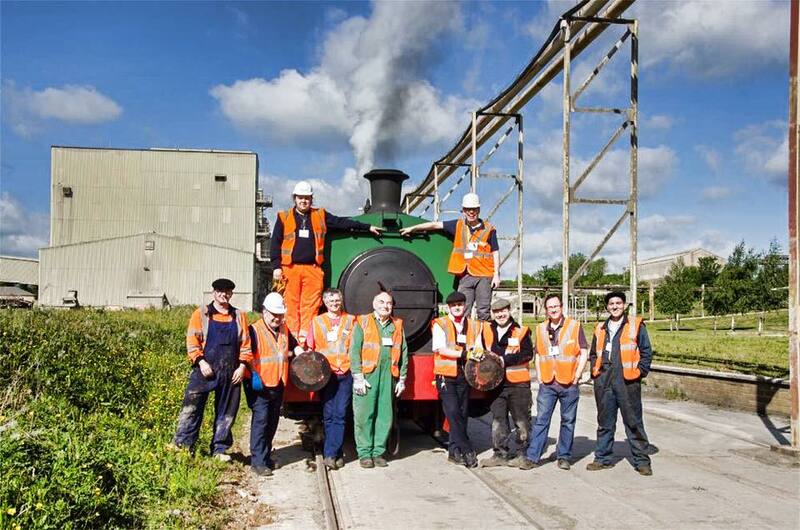 A truly superb weekend was enjoyed by visitors to Ketton Cement Works Open Day. Rocks By Rail supplied Sir Thomas Royden and two brake vans with our volunteer crews who were joined by volunteers from Chasewater and Tanfield. The Branch Line Society provided volunteer stewards to cope with high visitor numbers in the wonderful sunshine. Well over a thousand people enjoyed a trip along the plants railway on the Saturday alone – and twenty two trains were run! This is something of a record for Rocks By Rail. There was no rest on Sunday, as members of the Branch Line Society visited the plant for a tour of the coal store and exchange sidings, this saw a further four trains, again in glorous sun. These trains used the two resident Class 08 diesel shunters, and we were joined by volunteers of the Nene Valley Railway to crew one of the locos. We thank Hansons UK for laying on a most enjoyable event, and all the volunteers from various organisations who all pulled together to provide a great experience for the visitors. The event was captured through the lens of regular RBR photographer and volunteer Alistair Grieve, and you can enjoy his photographs from the weekend here. Back at Cottesmore, work continues with the IREC building and essential track maintenance. We very much hope to be able to resume our advertised events programme from July, but watch this space for updates. “We are very grateful for the support of the minerals industry in furthering our project which aims to highlight the heritage of the role played by railways in past quarrying activity in the East of England. We look forward to welcoming their representatives to view the completed project later in the year“.